And as the beers roll on we find KingBob and his glorious band of adventurers (I’m feeling in a Skyrim mood…look it up) rolling into the state of New York for the next beer, #355, Mother’s Milk by Keegan Ales. Brewed and bottled in Saratoga Springs, New York, this Milk or Sweet Stout has an ABV of 6%. According to the label, Keegan Ales is The Hudson Valley’s Brewery. This is also my first beer from Keegan Ales and that in itself is very cool! To the pour…and this was another beer that was black in color with a small light brown head. The nose was a fairly mild malty roasted concoction made up of cocoa, coffee, chocolate, and a bit of a smoky camp fire-esque aroma. I took a sip and was greeted by a ever so slight sweetness. I tasted milk chocolate followed by the slightly bitter and a bit course in texture cocoa mixed with a bit of smoke. It finished with a dark roasted coffee flavor that lasted into the aftertaste. It had a slightly heavier than medium body with some light tingling carbonation. It was quite easy to drink. This was a solid brew that I only wish was a tiny bit smoother and creamier. Now it is off to plan out my last 10 beers of this 365. I really am thinking of going all American big brewers like Bud, Miller and Coors for those last 10…I kid. It will be a cold day in KingBob’s realm before I sink that low. And now KingBob and his merry band of adventures must pack up and move on to our next destination…where that is I have no idea. I still haven’t visited my go to beer store to know the answer to that. Well I finally did it. I had a beer lined up tonight that I thought I hadn’t had before in the 365. I was wrong. So I poured it and took a picture of it then I checked my blog. Sure enough, I have already had Java Head by Troegs. I had to scramble to find one I didn’t have for beer #290. 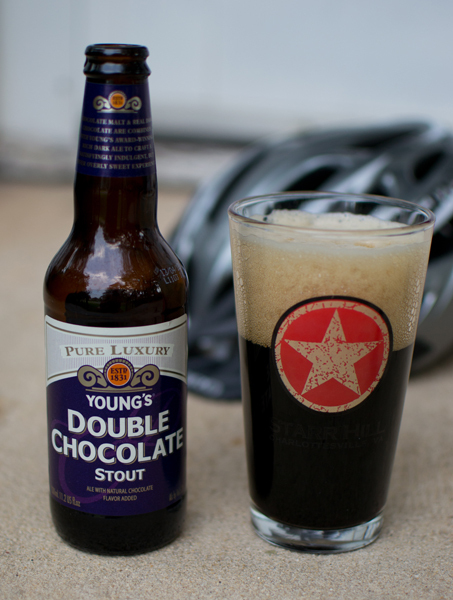 That beer is Young’s Double Chocolate Stout by Wells & Young’s LTD from across the pond, England. 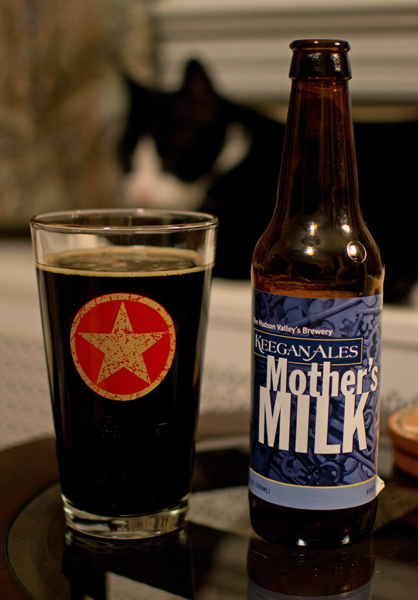 This Milk or Sweet Stout has an ABV of 5.2%. The color was black and sitting on top of that blackness was a huge tan head. The nose was coffee and chocolate. There was a nice roasted smell also along with a hoppy aroma buried in there…not quite citrus and not quite pine. Dark chocolate was the big star here in the taste. It had that bitterness and semi-sweetness I love in dark chocolate. There was little bit of a cold slightly burnt coffee flavor too. The body was a bit on the lighter side and that was disappointing. I wanted something a bit more substantial. There was some gentle carbonation here that just slightly stung the tongue. Don’t get me wrong, this was a very good beer. I just wanted it to be a bit more thick and chewy. If you like dark chocolate and coffee, I don’t know how you couldn’t like this. Are you ready for the football? Well you better be for they are back and the Cowboys will be ripping it up this year…ripping it up in a good or bad way is yet to be determined though. Oh well..go Cowboys! Beer #239 is another Horny Goat Brewing Company product, day 5 of the Horny Goat fest, from Wisconsin. Stacked Milk Stout is a Milk Stout, who would have thunk it? The ABV of this fine brew (really?) is 4%. Well it looked like a stout, it was a deep dark brown or quite possibly black. It also had the nicest head of any of the Horny Goat beers yet, a nice thick tan topped this Stacked Goat. This was another Horny Goat with a very light aroma of roasted coffee…it also has a bit of a sweet caramel malt thing going on in the nose. The sweet caramel malts show up first in the taste and then morph into a bit o’ coffee & chocolate. It was quite thin in the body with little in the way of carbonation. It was trying to be smooth and creamy but it didn’t quite get there. No alcohol presence whatsoever and the lightness of this make it super easy to drink. The cold has gone the way of the dodo bird…it has left the building. So why not celebrate with…hmm…what should I celebrate with? Why a beer of course! 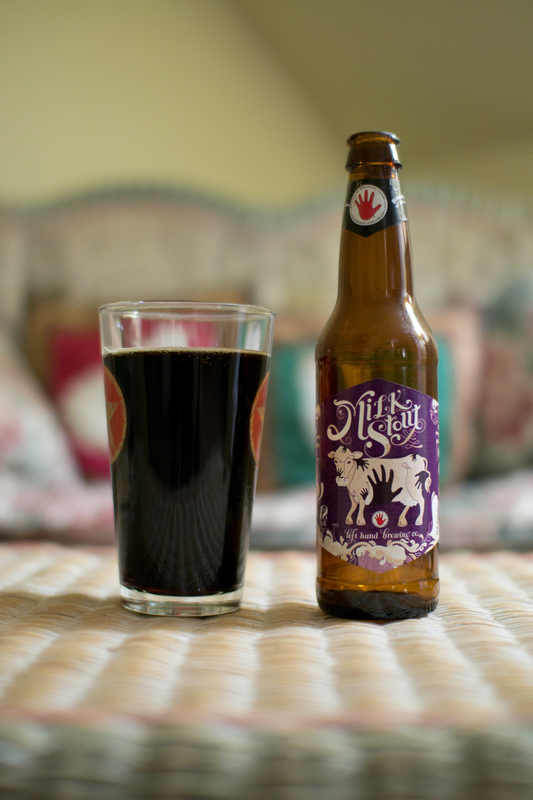 Beer #39 is Milk Stout by Left Hand Brewing Company. This brew is a Milk/Sweet Stout with an ABV of 6%. I love the label on this one, the funky cow with all of the left hands on it…good stuff. Not quite black, more like a very dark brown with a non existent head was staring back at me from my pint glass. The smell, wow it is so nice to be able to smell again, was sweet and chocolaty with roasted coffee aromas. I took a sip and was hit by coffee, sweet coffee, with some nice roasted malty flavors. I didn’t get chocolate like I did on the nose though. The mouthfeel was smooth and creamy with some nice tight carbonation going on. The body was neither too heavy nor too light…it was just right! The aftertaste reminded me of a good cup of black coffee. To me, this was a very easy beer to drink. I could easily have had a few more of these. This is a very good brew…one I will get again…and again…and again! Good stuff!! !